CityScape is a panoramic exhibition system for the Otago Settlers’ Museum. It engages visitors to the museum in building a shared narrative of place. Sustainability is a theme in our capstone projects. We have a focus on communicating and engaging people in aspects of sustainability. 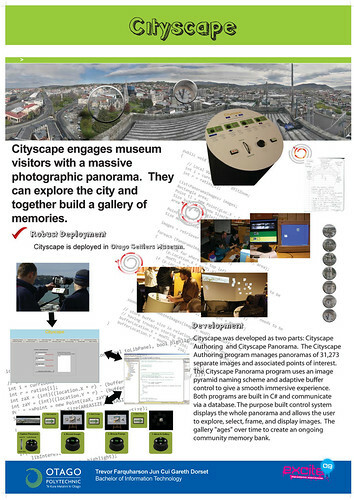 We took the CityScape poster to the CITRENZ Conference (incorporating the 23rd NACCQ conference) last week. And… what do you know…? it won! Last year the same team won the same Award for Student Research for their virtual ant farm for the Otago Museum. Well done Trevor Farquharson, Jun Cui and Gareth Dorset (and Hamish and Patricia). Here’s the short paper from the proceedings describing the project. (and us collecting the award).